Using the original parameters as described in the post I linked to above there have been 74 FTDs since 1971. Thirty-eight of them (53%) led to successful rallies. This is an interesting stat but it doesn’t tell the whole story. 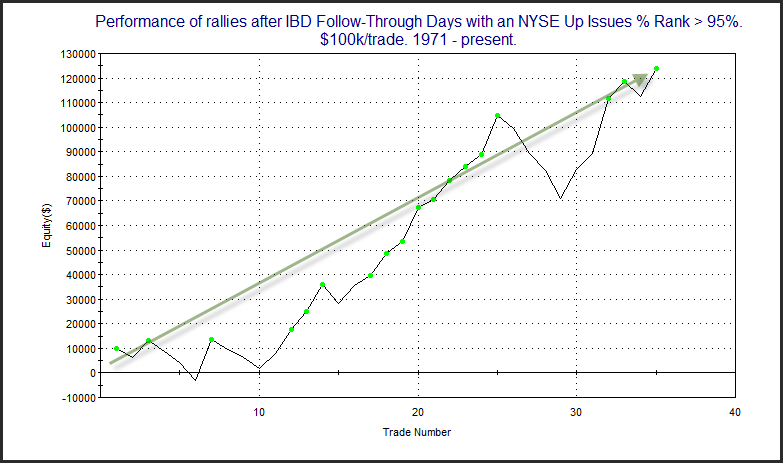 Below is an equity curve that I don’t believe I’ve ever shown prior to last night's subscriber letter. 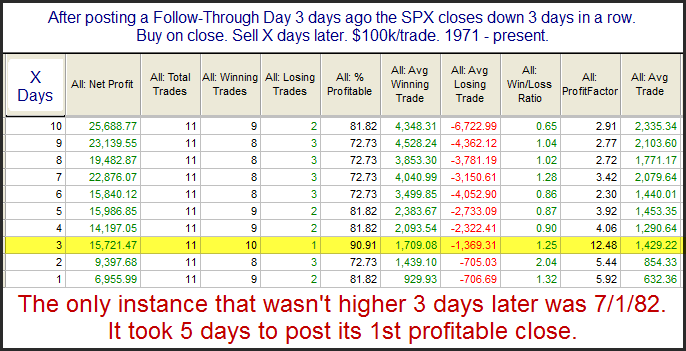 It shows how someone trading the SPX would have performed using FTDs as a buy trigger and then exiting the trade when the rally either “succeeded” or “failed”. Instances here are very low, but the results couldn't be any more bullish. The market has recently managed to ignore most bullish inclinations and continue to selloff. We’ll see if such readings can lead to a bounce as they have in the past or whether the market continues to act in a historically abnormal way. Full disclosure: 1) Scott is a friend of mine. 2) When you go to download the study it will ask you where you heard about it. Quantifiable Edges is one of the drop-down choices. I'm simply letting you know this so you're not surprised. I am not receiving any compensation from Scott for doing this and have no formal business relationship with him (though he did contribute a section to the Quantifiable Edges Guide to Fed Days book). I'm doing it both because I feel the study is good, and that Quantifiable Edges readers may find value in it. Of course if enough people choose the Quantifiable Edges drop-down then I will definitely bully him into buying me a beer next time I see him. I don't often discuss trade idea results from the subscriber letter here on the blog. In fact, I checked and it looks like the last time I did so was a little over two years ago. I used to do it more often, but I fell out of the habit. Also while I've always posted and tracked trade ideas in the subscriber letter, it isn't the main focus of the service. I don't consider Quantifiable Edges to be a stock picking service. I consider it one where traders can gain market and trading knowledge through the published research, systems, and tools. The objective is to provide tools and instruction to help traders improve their own trading and results. 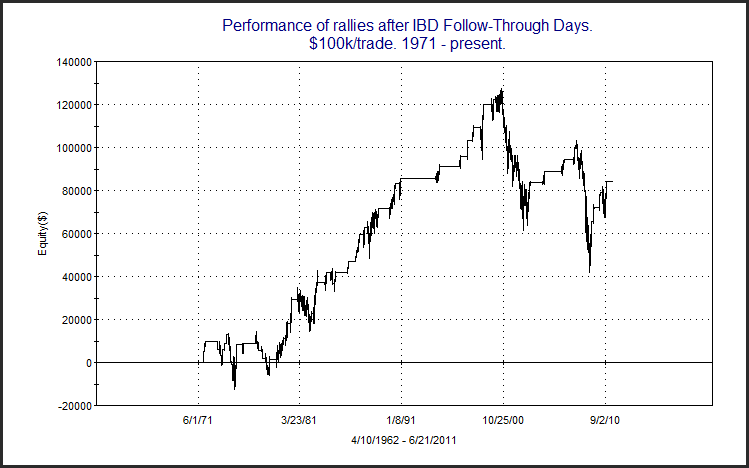 But the published trade ideas have done quite well. 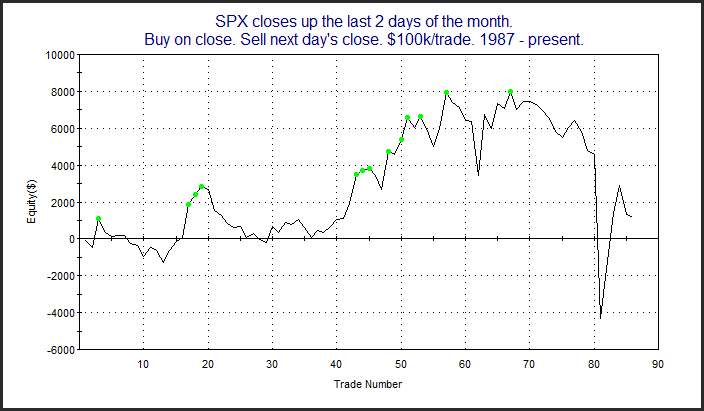 In fact, May marked the 8th month in a row where the trade ideas added up to positive gains. I've had several letters from subscribers lately telling me they've done quite well either following certain ideas or trading the systems, and explaining to me how they approach the trades. I don't suggest position sizes, and I would never suggest that the trade ideas represent any kind of complete portfolio strategy. 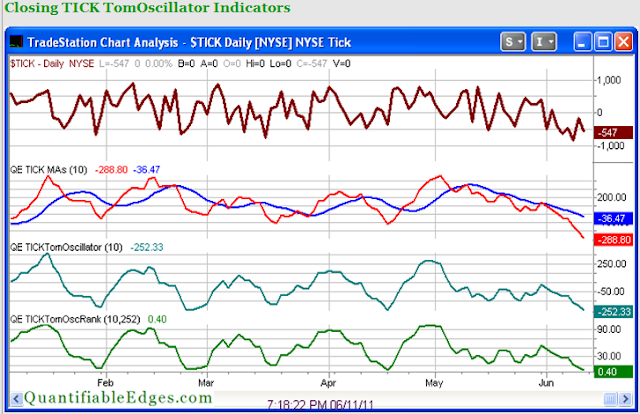 They are what they are -ideas about certain stocks or ETFs that have historically provided a statistical edge. All of the trade ideas are in either highly liquid ETFs or in highly liquid large cap stocks (almost exclusively S&P 100 components). I do this so that executing trades and getting fills at reasonable prices is not an issue. I think the most frustrating aspect of following trade ideas offered by another person (not that I'm encouraging that, but I know it happens) is not being able to get into or out of the trades that they suggest at a similar price. I’ve addressed this problem with limit prices and highly liquid securities. With a subscription to Quantifiable Edges I try and provide traders with ideas and instruction to improve their trading. 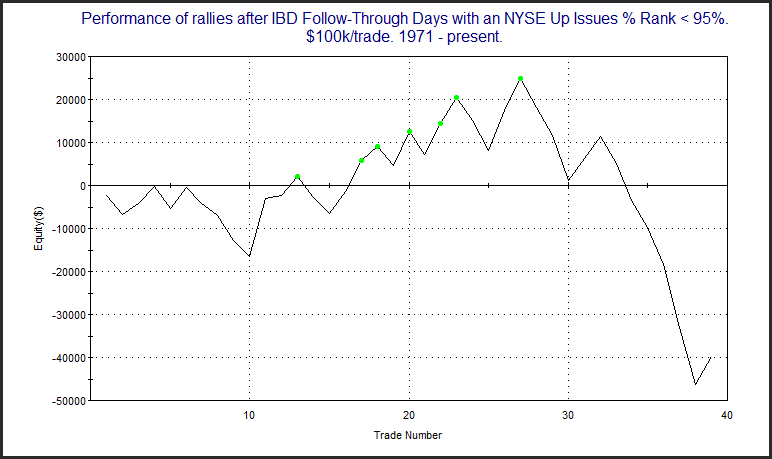 These ideas may come in the form of previously published studies identified by the Quantifinder, or they may be something I discuss in the current subscriber letter, or perhaps it's a webinar focused on a certain trading approach or indicator, or any other number of tools that I've designed and made available. (For a more complete list of tools, see the "Using Quantifiable Edges" series of posts.) The trade ideas found in the subscriber letter are examples of how I put these tools and ideas to work. While past performance is not necessarily indicative of future results, over the long run they’ve performed well enough that many subscribers have utilized them and easily paid for their subscriptions with the profits. So perhaps today action isn’t as black and white as it appeared in yesterday’s study. But then again – it never is. And isn't that what makes the market so interesting?